If your browser supports streaming audio, click here. 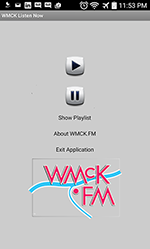 Or ... download the WMCK.FM Android App! We now have a free app available for Android phones!